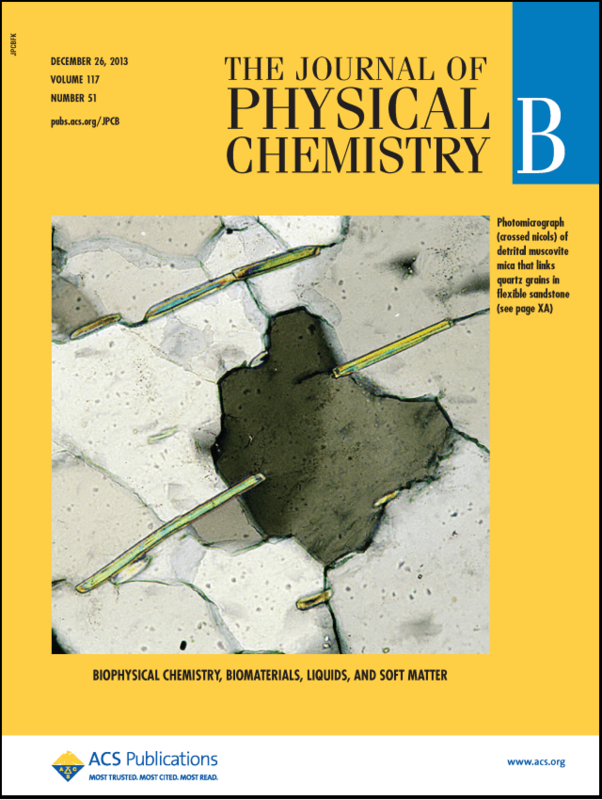 Adsorption properties of poly(carboxylate ether) to negatively charged surfaces in high-salt conditions. 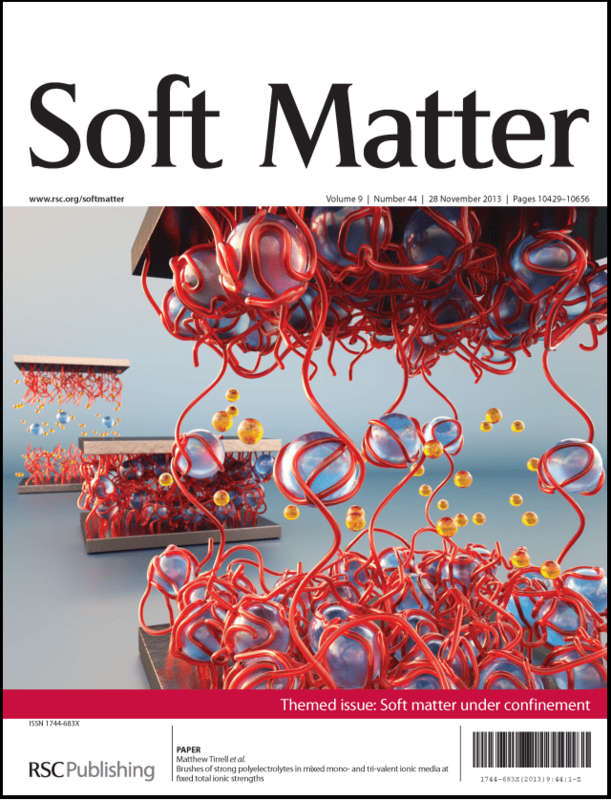 Interaction forces between negatively charged surfaces in high-salt solutions with three commercial cement dispersants were directly measured with sub-nanometer resolution using an older SurForce MkII surface forces apparatus SFA customized by the author. 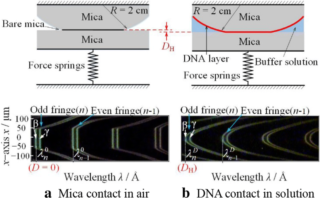 In this work, the SFA technique is used to investigate the effects of DNA concentration on the formation of single-stranded DNA (ss-DNA) films- a novel surface interaction study using an SFA2000. 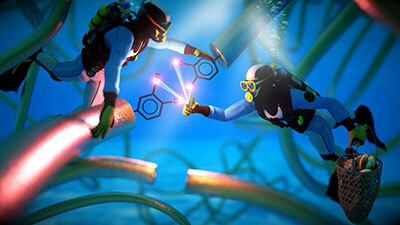 Molecular-scale insights using an SFA Mark 3 supporting the quest for a new generation of water-resistant adhesives, coatings and glues for biomedical, therapeutic and antifouling applications. 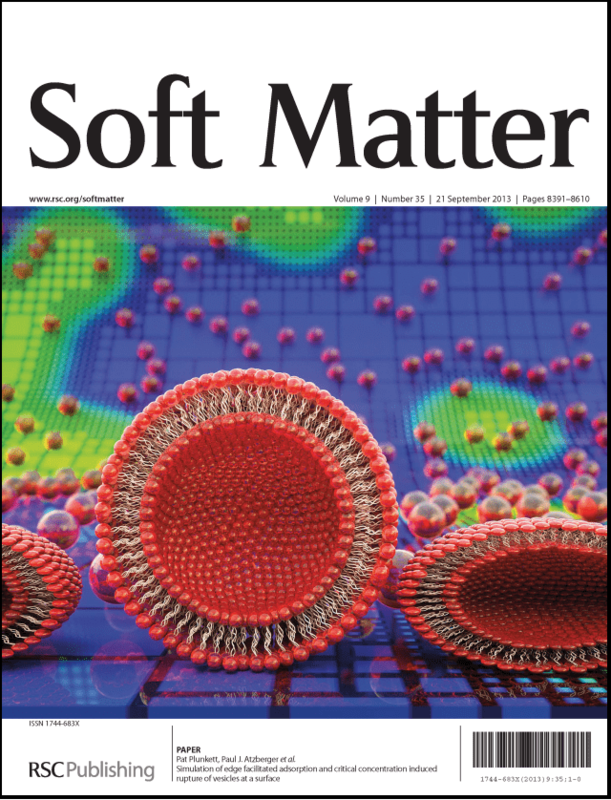 A great article published by Dong Woog Lee entitled Revisiting the Interaction Force Measurement Between Lipid Bilayers Using a Surface Forces Apparatus. 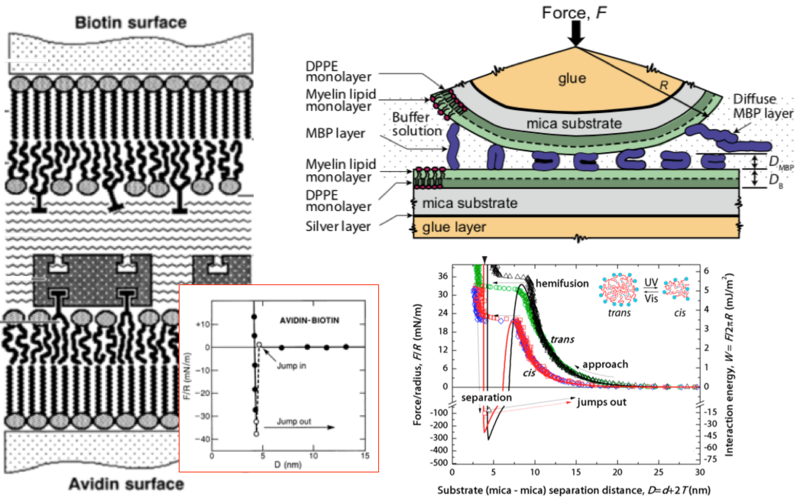 We recommend reading this review, summarizing research of intermembrane forces using the Surface Forces Apparatus. 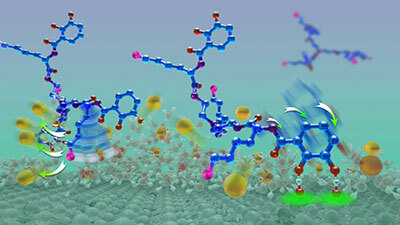 UCSB researchers find that the chemical topology of silica can influence the effectiveness of many chemical processes that use it. 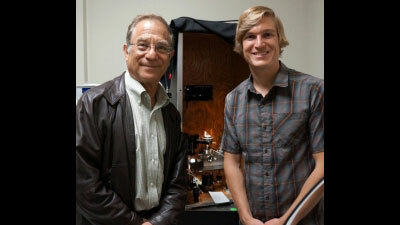 Researchers at the University of California, Davis, are investigating whether an analytical technique to measure friction between two surfaces can provide better understanding of wine sensory perception related to astringency and mouthfeel. Skeletal joints must provide lubrication under considerable load. 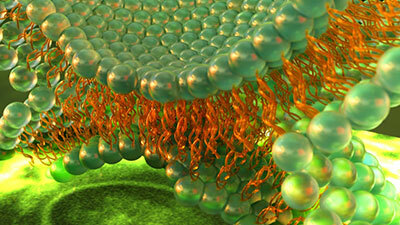 Lubrication between two sliding surfaces in aqueous environments can be greatly enhanced by polyelectrolyte brushes. 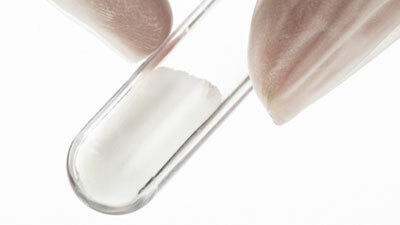 Adhesive strength testing of modified siderophore cyclic trichrysobactin (CTC) in saline environments- varying lysine and catechol in a wet adhesive; A Sticky Situation. 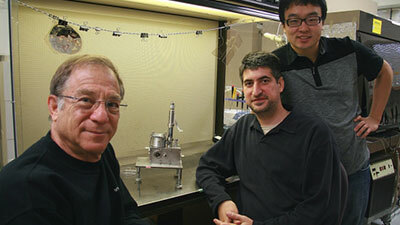 ​SFA2000 configuration: Basic configuration- Piezoelectric Top Mount & Main Translation Stage. 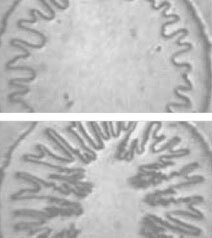 Simultaneous measurements of membrane thickness and interaction forces during hemifusion using an SFA combined with fluorescence microscopy; Seeing the Action. 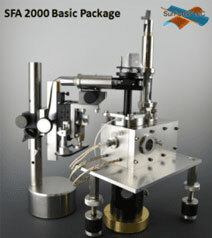 ​SFA2000 configuration: (FL-SFA) Piezoelectric Top Mount & Main Translation Stage with Fluorescence Microscope. 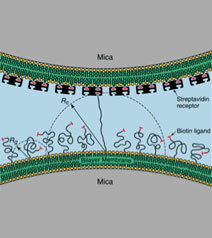 Myelin Basic Protein (MBP) adsorption by healthy and simulated diseased myelin bilayers- insights into demyelinating diseases; Unhealthy Attachments. ​SFA2000 configuration: Piezoelectric Top Mount and Main Translation Stage Bottom Mount. 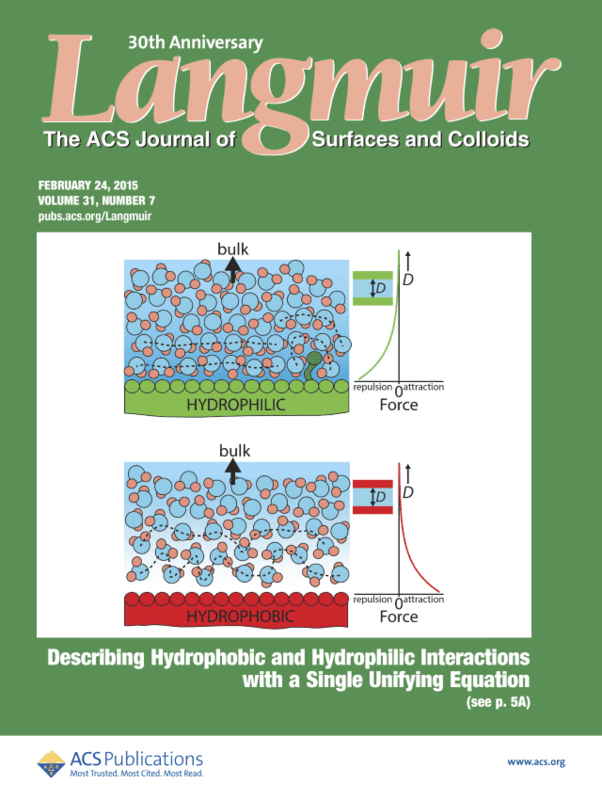 Ionic Liquid [C4mim][NTf2] charged surface screening indicative of a dilute weak-electrolyte (low-free-ion density) solution;Understanding the Energetics of Ionic Liquids. SFA2000 configuration: Electrochemcial (EC) Top Mount with Main Translation Stage Bottom Mount. 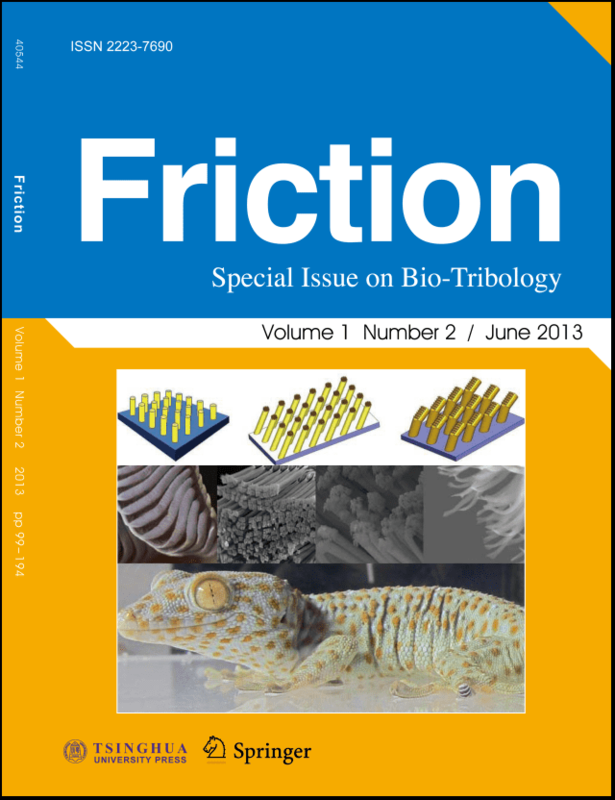 Stick-slip friction as primary mechanism degrading articular cartiledge;Mechanics of Arthritus. ​SFA2000 configuration: Friction Device Top Mount and Main Translation Stage Bottom Mount with addtiional strain gauging – (microtribometer configuration, does not require interferometry). 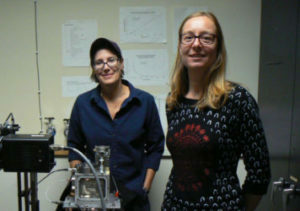 A fundamental understanding of the wettability of rock surfaces by crude oil and brine requires a good description of the interactions between the different materials. This aim was to measure those interactions and to establish their implications on the observed wetting behavior. 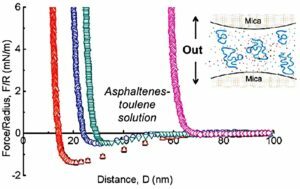 These results provide insights into the fundamental understanding of molecular interaction mechanisms of asphaltenes in organic solvents and stabilization/destabilization behaviors of water-in-oil emulsions with asphaltenes. 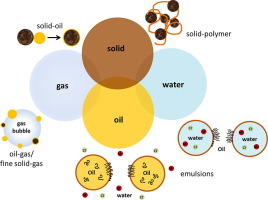 Interaction forces between petroleum components (e.g., asphaltenes) and mineral solids in both organic solvents and aqueous solutions are reviewed and correlated to the wettability change of the reservoir solids. The primary aim of this study was to investigate the “dilution effect”, where dilution of the ionic concentration of the fluid injected into oil wells has been found to enhance oil recovery. 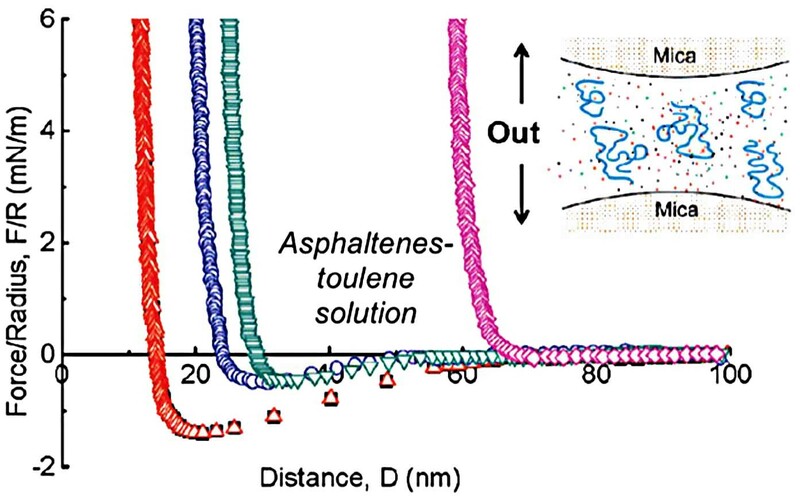 It is shown that in addition to van der Waals and electrostatic forces (included in the DLVO theory), polymer-like interactions of adsorbed asphaltene layers are involved in the overall process. 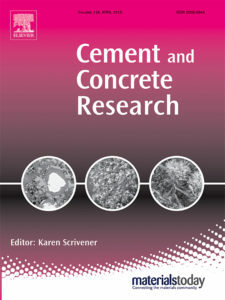 It was further established that the concept of an intrinsically oil-wet or water-wet surface or reservoir cannot, in general, be correct: depending on the nature of the oil and brine, different species in a crude oil will adsorb on the mineral surfaces and at the oil-water interface, thereby determining the wetting behavior of a reservoir or rock. 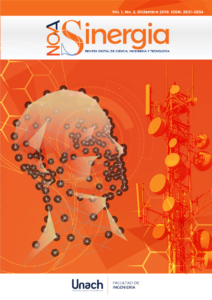 These findings should have a direct bearing on the theory and practice of EOR technology, and in particular they indicate that pure hydrocarbons such as alkanes are poor models for naturally occurring crude oils. 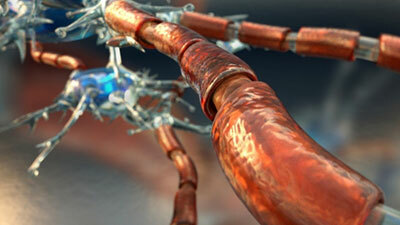 This research into real-time, micro- and nanoscale mechanisms of corrosion provides valuable information that scientists can build upon, which may lead to models and predictions of how and when materials in confined spaces are likely to corrode. 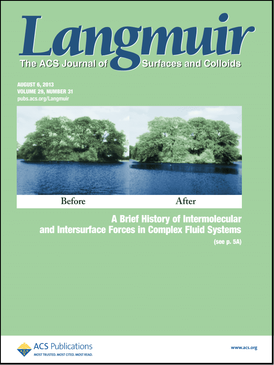 These front-covers are either based on measurements taken using a Surface Force Apparatus (SFA), refer to the historical role SFAs have played in the direct measurement of oscillatory structural forces, or support data taken using an SFA through additional simulation and analysis. 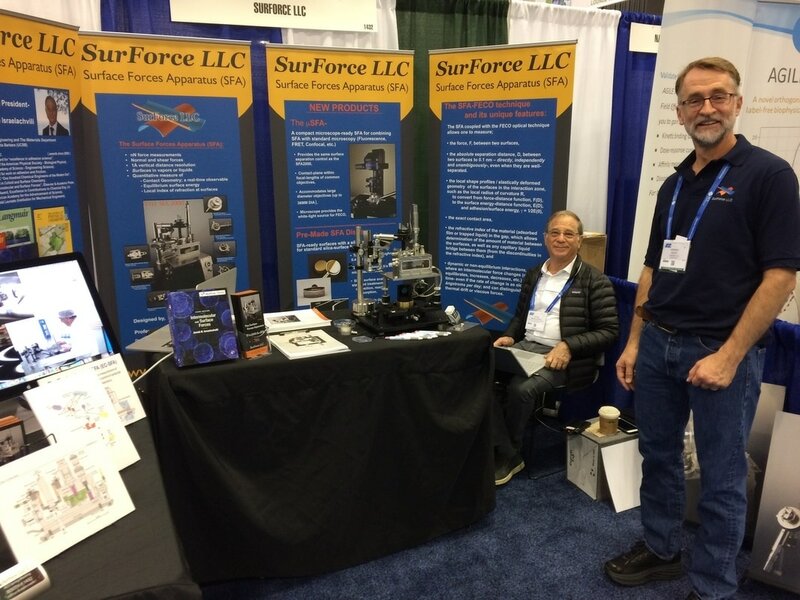 Interested in meeting the SurForce team in person? Click here to schedule a time to meet with us. 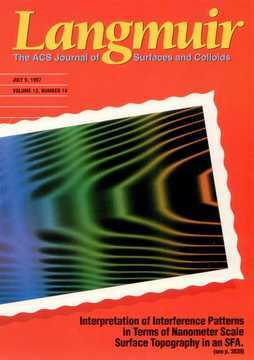 April 2 – 5, 2017 at 253rd ACS National Meeting in San Francisco, California. 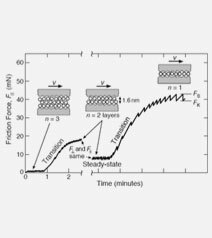 ​TITLE: Effects of salinity on oil recovery: Experimental and theoretical studies of crude oil water-calcite surface restricting and associated physical and (electro)chemical interactions. 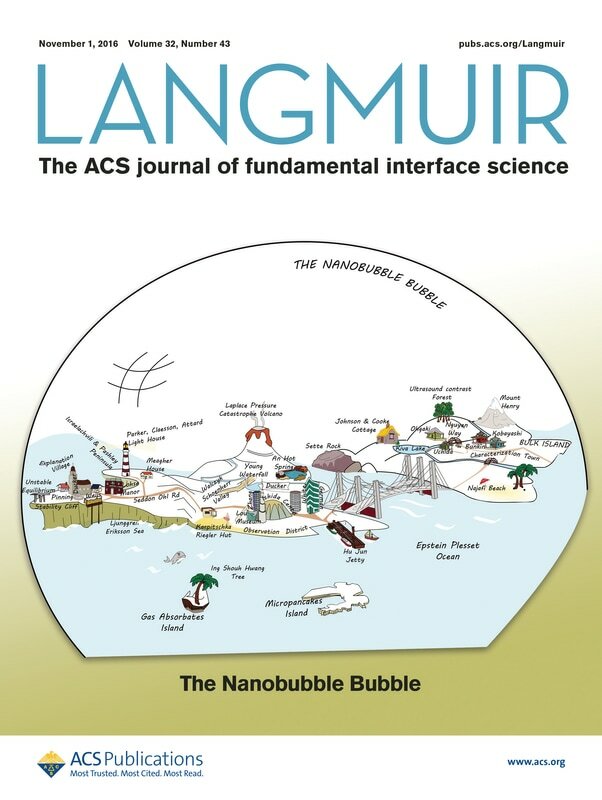 TITLE: Friction and lubrication from the nano (molecular) through the micro (μm-mm) to the macro (geological) scales, and over large time and velocity scales. August 23 – 29 at SFA 2014 – CAI-STEM in Cancun, Mexico.